Score amazing promos and deals with these bridal fair hacks this 2019! It’s Bridal Fair season and things can get a little overwhelming. Make your wedding planning easier by doing these 3 bridal fair hacks straight from the wedding industry experts. Over-canvassing or researching can actually hurt your wedding budget because as your wedding day gets closer, things will only get more expensive. Not to mention you can actually lose a pretty decent deal with a supplier you love to another bride or customer if you keep postponing booking that vendor. Remember, hundreds of soon-to-weds may have the same wedding date as you so book your supplier as early as possible. Once you get a good deal with a wedding supplier you have good chemistry with, seal that deal and never look back. On the spot booking means you pay to reserve or in full for a wedding service you want for your wedding. They may ask for a 50% downpayment or just a reservation fee, but this will mean they’ve saved the date for your event. Suppliers often give big and unbeatable wedding discounts and freebies when you book them on the spot at The Wedding Library’s Bridal Fair (Feb 15-17, Megatrade Halls 1, 2 & 3, SM Megamall) so don’t miss your chance to avail those big wedding promos! You don’t need to stress yourself by attending all the wedding fairs you hear about! you actually only have to attend one reputable one. 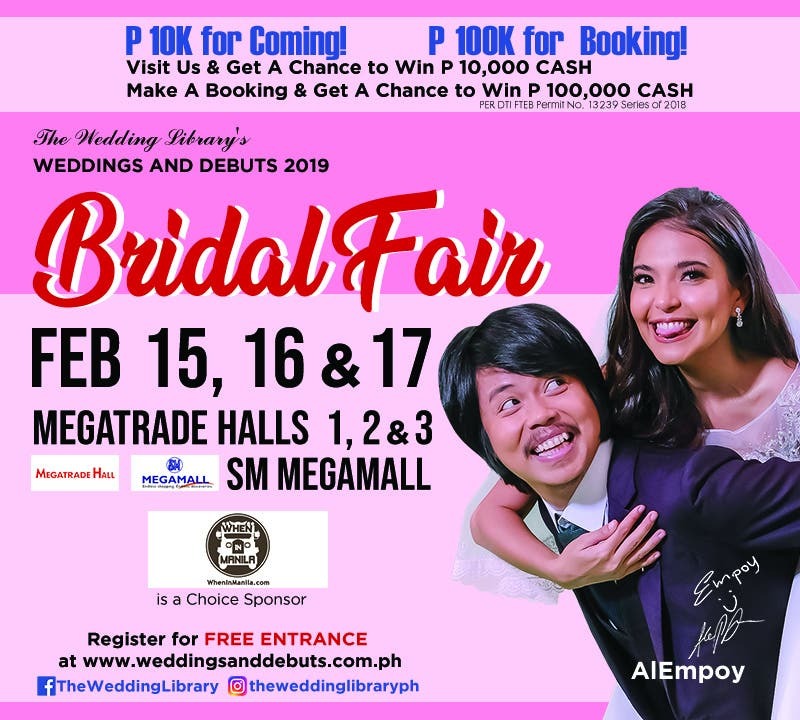 The Wedding Library’s Bridal Fair has over 350 trusted wedding suppliers waiting for you this Feb 15-17, 2019 at the Megatrade Halls 1, 2 & 3 SM Megamall! Known as the country’s most beloved bridal fair, The Wedding Library’s Bridal Fair will make your dream wedding come true by bringing all the best under one roof. You can also get a chance to WIN P100,000.00 by BOOKING on the spot or P10,000.00 by just ATTENDING! That’s extra wedding budget for you and your hubby.